PRE HEAT & BAKE: cupcakes as per instructions on pack. Make sure the cupcakes are cooled before you start icing them. PREPARE THE EYES: by twisting the Oreo’s in two – perfectly so that the icing is not detached! You can do this while the cupcakes are baking so that you have all the eye’s ready to place onto the cupcakes. PREPARE THE EARS: with the left over Oreo cookie that didn’t have any icing, break it in two to help form the ears. FROST THE CUPCAKE: with the chocolate icing (I found the whipped icing was fluffier and smoother to ice the cupcake with). As noted before, make sure the cupcakes are cooled before icing them! DECORATE THE CUPCAKE: by starting with the eyes first, then move to the beak and lastly put on the ears. 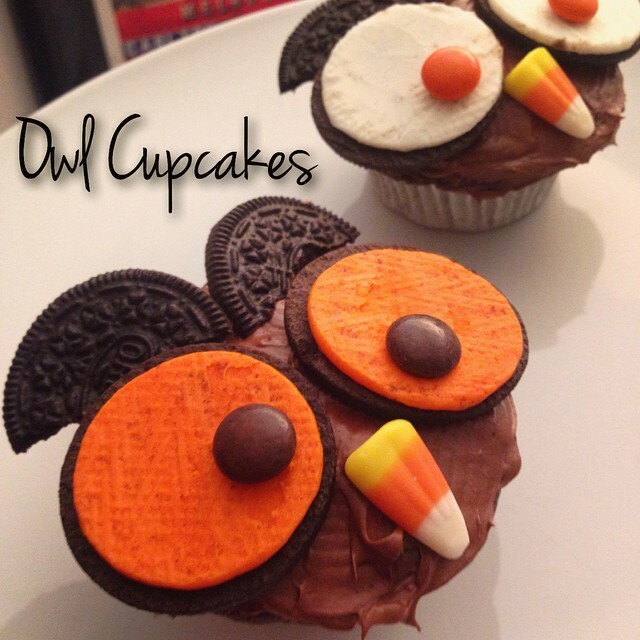 Posted in Baking, CupcakesTagged baking, cupcakes, fall, food, halloween, hoot, owl, recipesBookmark the permalink. these are so cute!! what do the halloween oreos taste like? pumpkin? These are absolutely adorable! Wonderful creativity!